Welcome back! Alumni Weekend is the cornerstone event for the Medical Alumni Association. Spend the weekend reconnecting with friends and classmates as you explore campus, participate in lectures and tours, and celebrate at class dinners. See you in Chicago! Make Method Atrium your first stop on campus to pick up registration materials, then plan to return throughout each day to connect with classmates, enjoy refreshments, access Wi-Fi and more. Consider Method Atrium your Alumni Weekend and Reunion Class Headquarters. Please note that some events and lectures will overlap, so plan accordingly. Click here for a downloadable version of the Alumni Weekend 2019 brochure. Click here for a timetable of events. **indicates that this session has been approved for AMA PRA Category 1 Credit. "Late Night" registration available online with Alumni Weekend Registration. Planning for the Future: What Will Your Legacy Be? For more information, please call 312-503-8012. By invitation. For more information, please call 312-503-0754. By invitation. For more information, please call 312-503-3459. Various locations TBA and determined by registration numbers. Find everything you need to plan your trip. We’re excited to offer free on-campus parking and discounted rates at nearby hotels. Click here to see a map of campus and the surrounding area. Hotel rooms have been arranged at various local hotels at discounted rates. Please mention Northwestern University Feinberg School of Medicine Alumni Weekend when you make your reservation and call early to ensure availability. Rates are guaranteed until March 26, 2019, or until the room blocks sell out. The rates shown below are per night. All Alumni Weekend events are accessible to those requiring mobility assistance. For special accommodations, please call 312-503-8012 or email medalum@northwestern.edu. Complimentary parking for the weekend is available on campus in the garage at 222 E. Huron St., on the corner of East Huron Street and North Saint Clair Street (Huron Superior Parking Lot). You will need to pull a ticket for entry. Then, at registration, please request a parking card that will allow you to exit and enter the structure throughout Alumni Weekend. Did you graduate with your MD degree in a year ending in a 4 or 9? If so, it’s your reunion year. 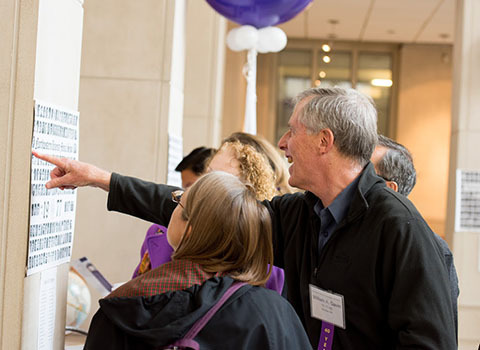 Find class-specific info below to connect with friends, join your reunion class committee, and find out more about making your class gift. A gift in honor of your reunion supports need-based scholarships, faculty recruitment, ground-breaking research and unparalleled learning experiences. All gifts made from September 1, 2018 through August 31, 2019, to any area of the medical school count as part of the class gift. Make your gift today to support the future of medicine. MD reunion alumni are encouraged to support the legacy of their classes by giving to a class scholarship fund. The classes of 1959, 1964, 1969 and 1974 have established endowed class funds at the medical school. For all other classes, any gift to anywhere in the medical school will count towards your class gift. Each year, roughly half of our medical students receive scholarships. To support one of our top priorities and to secure our place among the nation’s premier institutions, we endeavor to make a Northwestern medical education accessible to the very best students, regardless of their economic background. 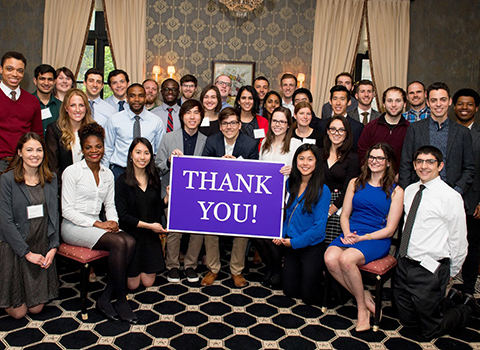 Your class scholarship will enable more students to reap the benefits of a Northwestern medical education without bearing a significant financial burden. Scholarships also help ensure that our community more accurately reflects the world at large — and that every student benefits from an environment rich with diverse perspectives. Which classes are celebrating their reunions this year? Classes whose graduation years ended in a 4 or 9. For example, the class of 1969 will be celebrating its 50th. How can I find out if someone from my class is attending? Beginning January 2, when registration opens, you'll be able to view the Attendee List. My class is not celebrating a major reunion; will there still be things for me to do? Yes. While we have some special activities and recognition for those classes in a reunion year, this is truly an all-alumni weekend. Any alumnus/a, guests and family members are welcome to register for any scheduled event. Please note that hospital tour attendees must be 18 years or older. How can I change or add to my registration once it is submitted? You may add to your registration online by clicking the link at the bottom of your confirmation email. You may add events and/or guests to your original registration at any time before the registration deadline. You will not be able to delete events from your registration. 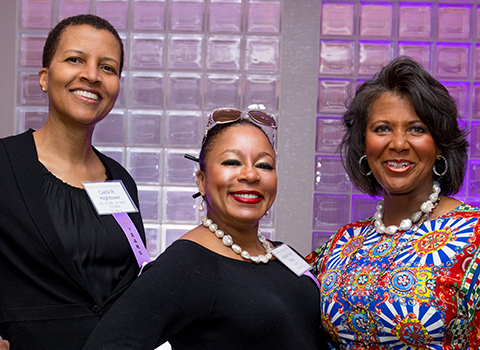 Please email your request to medalum-reunion@northwestern.edu. If something comes up, can I cancel and receive a refund? We understand that sometimes life interferes with our best-laid plans, so we will accept cancellations. Cancellations must be received by Friday, April 19, to be entitled to a refund. You may still cancel after April 19, but a refund cannot be guaranteed for cancellations made after that date. Please email medalum-reunion@northwestern.edu with your request. Do I need to print and bring my registration email with me? No, it is not necessary. We will have your printed itinerary available at registration. In Method Atrium (320 E. Superior St.). Where can I pick up my nametag and itinerary if I didn't make it to registration? If you miss regular registration hours (Friday from 8:00 a.m. to 5:00 p.m. and Saturday from 8:00 a.m. to 1:00 p.m.), we will have your nametag(s) at your first paid event. Do I have to bring my nametag to every event? Yes, please wear your nametag to every event. We will prepare one nametag for the weekend. Can I get CME credit for attending Alumni Weekend programming? Yes, we will be offering 9 forums for CME credit for a total of 4.5 hours. You can find these forums on our Schedule of Events designated with ** following the title. Physicians should only claim the credit commensurate with the extent of their participation in the activity. How do I take advantage of the complimentary parking? Dress throughout the weekend is casual, although some may choose to dress up for the Celebrate in Chicago event and for class dinners. Yes, the bookstore will be open on Friday from 9:30 a.m. to 5:00 p.m.. Unfortunately, the bookstore will not have Saturday hours. You can find the bookstore in Abbott Hall, at the corner of East Superior Street and North Lake Shore Drive, on the first floor. Will there be photos taken during Alumni Weekend? Yes, photographers will be at most of our events. Please note, a class photo will be taken at each of the Class Dinners on Saturday. The select photographs will be available after Alumni Weekend, and all reunion classes will receive a copy of their class photo.